The snapshot below of the twitter exchange is pretty self explanatory. It might help to know that Papineau is referring to a letter from Manne that the TLS printed, with unfortunately one sentence ommitted that’s unfortunate because the ommitted sentence, as I underrstood it, went into some specifics about how philosophical combat works against women. This missing material is brought up in the exchange. Part of Manne letter is copied here. There was quite a bit more to the twitter exchange. I’m putting it up because it vivdly illustrates how a senior philosopher with a great deal of experience of academia, can be quite clueless about a powerful negative feature women face. And I’d love to hear what you all think. Unfortunately the links on the snapshot don’t work. phlosophical babies – a new record? It’s hard to follow the back and forth, especially when the format requires 140 characters or less. I took David’s point to be that the negative feature that women face in philosophy doesn’t account for the dearth of women in the profession, not that it isn’t a negative feature that women face in the profession. Is that how you read him or did you read him as denying that the feature is a feature? C, which negative feature are you referring to? Fair bit of armchair speculating going on – I’m not sure why relevant analyses aren’t being deployed. Some years ago Leeds UCU conducted an equalities survey that ‘drilled down’ (ugh, I know …) into the data on promotions at UoL and interviewed various colleagues across various spectra (gender, career stage etc.). Heads of School and the like reported that they felt female colleagues were insufficiently pushy i.e. they were perceived as not putting themselves forward for promotion sufficiently strongly. Female colleagues on the other hand reported that they felt they received less in the way of advice and support in general from their Heads and senior colleagues e.g. male colleagues would receive the benefit of 1-1 pre-promotion support and encouragement while women would be more or less left to ‘their own devices’. So Papineau as a senior academic and former Head seems to be simply reiterating the perception of his fellow Heads, which jars with that of female colleagues who feel excluded from the ‘boys club’ of male mutual support and encouragement. With the result, not surprisingly, that the % of women declines dramarically as one goes up the career grades (this is all in the UK context of course). Bottom line: there are data and surveys and stats out there that can be drawn on instead of armchair speculation as to what’s likely or not! That was the negative feature I had in mind. This remark, “I’m putting it up because it vividly illustrates how a senior philosopher with a great deal of experience of academia, can be quite clueless about a powerful negative feature women face” suggested (to me, at least) that David was denying that a common experience of women in philosophy is that the combative nature can work against them in many ways, but I took him to be skeptical of the suggestion that this experience would account for the dearth of women in academic posts. I didn’t think he was skeptical of the claim that women philosophical combat can work against women in a myriad of ways in the profession. For what it’s worth, I thought that David hadn’t given sufficient weight to the points that I’ve seen Kate make on facebook, but I also saw David’s aim as trying to do something quite similar to what Paxton, Figdor, and Tiberius were doing, which was to identify factors that would account for the gender differences early on in the progression up the academic ladder. If you think that a significant part of the story about underrepresentation will focus on the earliest steps up the ladder (e.g., the move from intro classes to major, say), you might be worried about explanations of underrepresentation that focus primarily on things like biasing factors in hiring. I suspect that that’s what’s going on with David, but I also think it’s fair to say that someone who adopts this stance might take things too far in failing to take account of the kinds of points that Kate and others have made in response to David’s review. “Hannah Riley Bowles, a senior lecturer at Harvard’s Kennedy School of Government and the director of the Women and Power program, has been studying gender effects on negotiation through laboratory studies, case studies, and extensive interviews with executives and employees in diverse fields. She’s repeatedly found evidence that our implicit gender perceptions mean that the advice that women stand up for themselves and assert their position strongly in negotiations may not have the intended effect. It may even backfire. In four studies, Bowles and collaborators from Carnegie Mellon found that people penalized women who initiated negotiations for higher compensation more than they did men. The effect held whether they saw the negotiation on video or read about it on paper, whether they viewed it from a disinterested third-party perspective or imagined themselves as senior managers in a corporation evaluating an internal candidate. Even women penalized the women who initiated the conversation, though they also penalized the men who did so. They just didn’t seem to like seeing someone ask for more money. In a follow-up study, Bowles asked participants whether they themselves would negotiate in the given scenario—that is, they were now the job candidate and not the evaluating manager. The women, for the most part, said no. They were nervous that the conversation would turn against them. “Women are more reticent to negotiate than men, for good reason,” Bowles says. “Not only are men more likely than women to earn tenure, but in computer science and sociology, they are significantly more likely to earn tenure than are women who have the same research productivity. In English men are slightly (but not in a statistically significant way) more likely than women to earn tenure. . . In sociology, she found that the odds of a woman earning tenure were 51 percent lower than for men, when controlling for research productivity. In computer science, the figure was 55 percent. Those gaps are “highly significant,” she said. These figures suggest, Weisshaar said, that it’s not that women have to find ways to become as productive as men, but that women must be more productive than men if they want to earn tenure at a research university. That is, if not putting oneself forward for promotion sufficiently strongly involves either having a research profile similar to ones colleagues or evokes similar psychological reactions as does negotiating monetary compensation, there are some empirical reasons to think that if women lived up to what we think we expect from them, they would not benefit from it as it may not be recognized as meeting our standards once they’ve actually done it. This may reveal a significant difference between the situations in the UK and the U.S. Here there is comparatively little opportunity to enter into negotiations over ones pay – typically only on appointment, when you can negotiate to be placed on a particular spine point within the grade as advertised, or, if you’re a Prof. to be allocated to a higher Professorial ‘zone’. Not surprisingly, perhaps, when these professorial zones were introduced at Leeds, we had a no of cases of women who were assigned to the lowest zone, despite having research profiles that were at least as good if not better than their male colleagues who were put in the higher zones (in one case I dealt with the female Prof concerned was told it was because her work dealt with ‘marginal issues’). When it comes to promotions, we all submit our application to a panel and completing the forms is time consuming and tricky, in terms of getting the balance right and highlighting the relevant aspects of ones teaching, admin and research. The survey I mentioned indicated that male colleagues typically received much more support in preparing these docs than their female counterparts and that seemed to be a crucial factor in accounting for the difference in promotion stats. (As for balancing admin and research, this is achieved in principle by workload models that are supposed to ensure we all have the same workload, according to a certain metric. Although there are cases of significant imbalances and although some of these have been borne by female colleagues, these don’t seem to have been a major factor with regard to promotions overall). Fwiw! Thanks Steven — that’s interesting. So, was the view that women weren’t “pushy” enough regarding efforts to secure support in preparing their applications? Or more general? Sorry C, you posted as I was writing my reply to Steve earlier and I didn’t have time until now to reply to you. I can’t speak for the intent of the post as I didn’t write it, but I interpreted it to be referring to the particular dispute between Manne and Papineau regarding the difference between women being “put off” versus women being “pushed out,” and not to regard whether a certain combative style can work against women more generally. Noetika & Steven: yes, both. I’m sorry to be late in responding. My iPad has taken against my replying, but now I’m back at a laptop. There’s a lot going on in comments, and I won’t try to cover everything, but let me at least start with a few observations/comments. 2. Noetika has done us a service in supplying a significant amount of evidence, instead of armchair speculation. It should be known that most women who are working in this sort of area are close to overloaded with relevant data. Arm chair speculation is definitely not what is going on. For example, the US National Science Foundation has spent close to a third of a billion dollars over 199 institutions in an attempt to get more women securely positioned in STEM; this is the Advance Program. The money to institutions almost always supports a significant amount of funding for research on diversity and its problems. There is tons of data on correlations between aggressive behavior and career deficits for women. This connection was a theme initiated in one of the earliest researchers with an Advance Grant, Virginia Valian. Jenny Saul organized a wonderful series of workshops on bias at the University of Sheffield, and Virginia was at just about everyone. Her research is extremely well known to people working in the area of biases and stereotypes. Heads of School and the like reported that they felt female colleagues were insufficiently pushy i.e. they were perceived as not putting themselves forward for promotion sufficiently strongly. Female colleagues on the other hand reported that they felt they received less in the way of advice and support in general from their Heads and senior colleagues e.g. male colleagues would receive the benefit of 1-1 pre-promotion support and encouragement while women would be more or less left to ‘their own devices’. Interestingly, googling suggests there are a lot of workshops in the UK to teach women academics how to be assertive without being aggressive; presumably this is two-fold: learning how to ask for raises, etc, without getting a negative rejection. I hope I’ve clarified some issues. Katy, I love it. I have a colleague who was returning to campus after having a biopsy on a lump in her breast. She hadn’t had the results, and was very worried. She met her dean passing on a sidewalk and apparently was insufficiently enthusiastic about seeing him. That she didn’t smile cheerfully ended up on her performance review. She has recently had a couple of serious disagreements with our boys’ club, which have been dismissed as irrational or incomprehensible. Somewhat similar reactions led me eventually to file a complaint with the federal Equal Employment Opportunities Commission, so I received some compensation for what the university termed my “creative and brilliant contributions” to the university. I mention their characterization because it is beyond doubt that the guys immediately above me in the power chain did not see me in this light at all. When I was at an APA around this time, I met with three other senior female philosophers. We all had had to hire lawyers. Yes, the former – Heads reported that they felt that female colleagues were not ‘proactive enough’ with regard to promotion. Anne – yes indeed, this is akin to blaming the victim and such reports can be interpreted as attempts to absolve themselves from responsibility. My point was, in part, to illustrate the disparity between how senior academics/heads of school perceived things, or at least, reported how they perceived things, and how female colleagues themselves perceived them. It is perhaps not surprising that senior male academics who are not, for example, dealing with cases of career suppression, harassment, bullying etc on a regular basis, may perceive things in a certain way, leading to them make assertions about the likelihood or not of certain causes for the gender disparities from their armchairs (!). Finally, it is worth noting, as I tried to indicate, that the situations in the UK and the U.S., although similar in some respects, are significantly different in others. There is less scope here for requesting a raise, for example, as we’re all placed on a pay scale and we proceed up that point by point on an annual basis until we hit the top of our grade, which is when the promotion process comes in. Thus, when it comes to pay increases, promotions and career progression here, It’s not just implicit bias that needs to be dealt with but also explicit bias and that’s not going to be confronted through workshops but by collective action leading to rigorous institutional policies (on eg promotion support and mentoring). Steven, thanks for the clarifications and further thoughts. I’m not sure quite why senior administrators in the States seem to be more aware of the issues we are discussing, but my limited exposure suggests they in general are. On the other hand, one of the people I ended up complaining against in my EEOC actions was a quite senior African American administrator, who didn’t seem very aware at all of how bias and discrimination works against women. It was so weird. >I doubt that the best solution is for women to “develop their own ‘philosophies’”, as [Paul Wallace] urges. All philosophical issues matter to both genders: they need to be subject to reasoned debate between all, not power struggles (currently male-dominated, we might note) between biased gender perspectives. 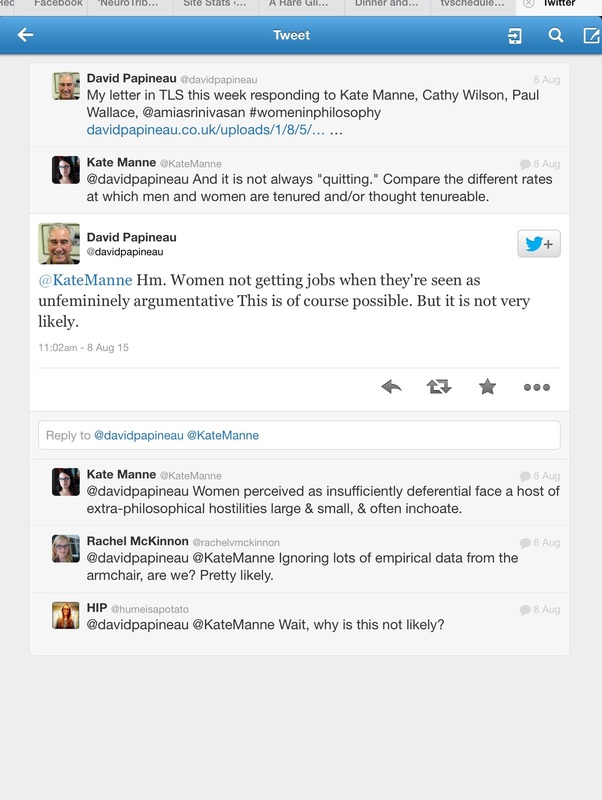 My critique is related to the ‘armchair moment’ in the twitter image above, in the sense that carelessness and assumptiveness (“I doubt that…”), rather than a curious and inclusive attitude about data and approach, is part and parcel of patriarchy in philosophy. ‘I doubt it’ ain’t an argument, and neither is a perfectly mindless call for universalism. These and other errors creep in, and then stick around unduly, in our system; that, in fact, is the impetus for a large swath of feminine philosophy, in one phrase.